CO-OP Shared Branches are credit unions that accept member transactions on behalf of other credit unions. To use a Shared Branch, all you need is your DCU Member Number and a photo ID. It seems like everywhere you go there is a conveniently located Shared Branch ready to assist you. I've been to several Shared Branches and each time I received excellent customer service. The first time I visited one I assumed I'd get "second class" treatment since I wasn't THEIR customer. I'm glad they made it a pleasant experience. 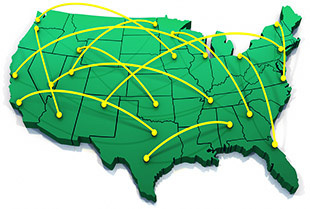 For CO-OP Shared Branch locations, please visit the CO-OP Shared Branch locator. *NOTE–The CO-OP Shared Branch locator is outside the DCU website. While CO-OP Shared Branches strive to keep their site up to date, DCU cannot be responsible for inaccurate information. CO-OP Network Shared Branches is rated 3.1 out of 5 by 11. Rated 5 out of 5 by JBW from Makes it practical to use DCU as primary financial institution We use DCU through a local branch of Service Credit Union. It works seamlessly. There are some restrictions (like a $500 cash withdrawal maximum at the CO-OP branch), but it is nearly as good as having a local DCU branch, though we are 80 miles from the nearest DCU branch. Great to see credit unions cooperating with each other to provide better service for all members. Rated 5 out of 5 by Brandy from Absolutely delighted Nowadays, I live way outside of DCU's local service area, and when depositing oversized checks, I had resorted to using USPS Express Mail or FedEx Overnight to make my deposits. With CO-OP Shared Branch, I was able to stroll into a Telco CU branch, fill out a simple form, and make my deposit in minutes. It was like being "home" in New England. Rated 5 out of 5 by jayamshri from Pleasent Experience We were searching for the branch and the time i reached the branch (Visionaru Federal Credit Union, Bridgeville, PA) it was closed for the day and had window services open, I was greeted by the officer well and she helped a lot, was very pleasent. Thanks a lot to her and I felt that it was my home branch even though i was not having any account with VFCU. Thanks to Ms. April who was inchagre for that day. Rated 5 out of 5 by skorpian_guy from Extremely helpful Very helpful when there is no DCU branch near you. Rated 5 out of 5 by GregoryK from Extremely helpful and convenient. It seems like everywhere you go there is a conveniently located CU Service Center ready to assist you. I've been to several CU Service Centers and each time I received excellent customer service. The first time I visited one I assumed I'd get "second class" treatment since I wasn't THEIR customer. I'm glad they made it a pleasant experience. Rated 1 out of 5 by Carl from Limited services at coop branches CO-OP branches may not be able to support withdrawals; Hanscom FCU has to call DCU to authorize a withdrawal and couldn’t get anyone on the phone. In practice, this does very little to augment DCU’s limited hours and locations. Can I get a cashier's check or money order using money from checking account? Yes, cashier checks and money orders are available services at most Co-op Shared Branch locations. You may use the Branch/ATM Locator tool from the upper right corner of our home page to obtain the information and phone number of the location nearest you to call and confirm prior to visiting. How to specify beneficiary on cashier's check? If you need to purchase a treasurer's check (cashier's check) payable to someone else, please call us, use Bill Payer, or visit a DCU Branch or CU Service Center in person. Can I cash a DCU check at shared branch? Each Shared Branch has their own policy on check cashing and you would want to contact the branch in your area for more information. You may however deposit the check to your DCU Account at the Shared Branch. I traveled to the nearest Co-Op Network ATM (in Quincy, MA) to perform my first ATM withdrawal. I was surprised that the Co-Op location assessed an ATM fee. I thought the cooperation between the Co-Op members did not do that. Very disappointed. Also, my ATM card, which at DCU can access three different accounts, was only able to withdraw from the default account. ATM locators are maintained by the individual networks. Although they make every effort to keep the information accurate, from time to time they may not be up to date. The ATM owner determines which of their ATMs will assess surcharges. Network ATMs will only permit you to access your Savings 1 and the primary Checking associated with the card being used. Only DCU ATM locations will allow you to access all accounts within your Membership. Do I need any amount of money to open a checking account with you? A minimum $5 deposit maintained in a Primary Savings account is all that is needed to qualify for any other DCU products and services, including a DCU Checking. I always have excellent service. The service representatives are very helpful and courteous whenever I have any questions or need information. DCU Branch Locator – Select the services you're looking for and choose your desired location. DCU Free Checking – Learn about DCU's Free Checking account and open online.